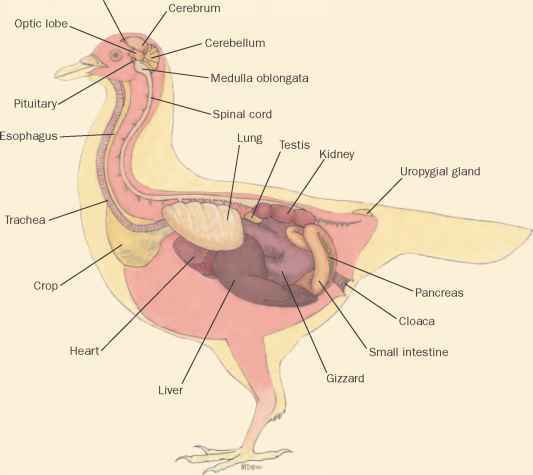 Physical characteristics: Dodos were large birds about the size of a turkey. They had dark gray feathers on the back and somewhat lighter gray feathers on the belly. The wings were tiny and yellowish white in color. The tail was small and short, made up of five curled feathers. Dodos had large, yellow hooked bills. The face was feather-less, with gray skin. Geographic range: Dodos were found on the island of Mauritius in the Indian Ocean, about 500 miles (800 kilometers) east of Madagascar. Habitat: The dodo inhabited woodland areas. Diet: Dodos ate fruit. They also swallowed small stones to help with digesting food in the crop, an organ found near the throat. Behavior and reproduction: Dodos could not fly, but were able to run quickly. When a dodo was caught, it would scream and other dodos would rush to the site, getting caught themselves. 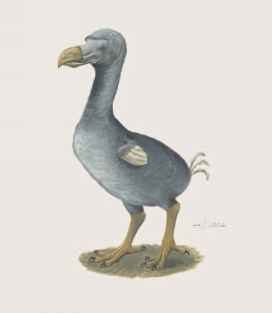 One sailor described dodos as "serene and majestic" and said that they did not run away from humans. Dodos built nests on the ground. Only one egg was laid at a time. Judging by their size, eggs probably hatched after about thirty-seven days. Dodos and people: Sailors traveling in the Indian Ocean caught dodos in large numbers for food. The dodo is the first recorded species that was driven to extinction by human activity. Hachisuka, M. The Dodo and Kindred Birds, or the Extinct Birds of the Mascarene Islands. London: Witherby, 1953. Quammen, D. The Song of the Dodo: Island Biogeography in an Age of Extinctions. New York: Scriber, 1996. "Family Raphidae (Dodo and Solitaires)." Animal Diversity Web. http://animaldiversity.ummz.umich.edu/site/accounts/classification/ Raphidae.html#Raphidae (accessed on June 12, 2004).